Ceviche (“seh-BEE-chay” or "suh-VEE-chey) is a hugely popular dish in South America. The basic ingredient is raw fish cut into bite-size pieces and marinated in the juice of an acidic fruit (usually lime), salt and seasonings (usually chili peppers). The citric acid in the juice changes the texture of the fish without changing its “raw” taste. Ceviche has deep roots in South America, dating back to the earliest inhabitants. The Incas preserved their fish with fruit juice, salt and chili peppers, and later the Spanish conquerors introduced the now-essential limes. Common wisdom says the lime juice “cooks” the fish -- partially or completely, depending on how long it is marinated. The citric acid in the lime juice alters the structure of the proteins in the fish, making the fish more opaque and firm, just as if it had been cooked with heat. But the acid does not kill bacteria and parasites as well as heat does, so it’s important to start with the freshest, cleanest fish possible. 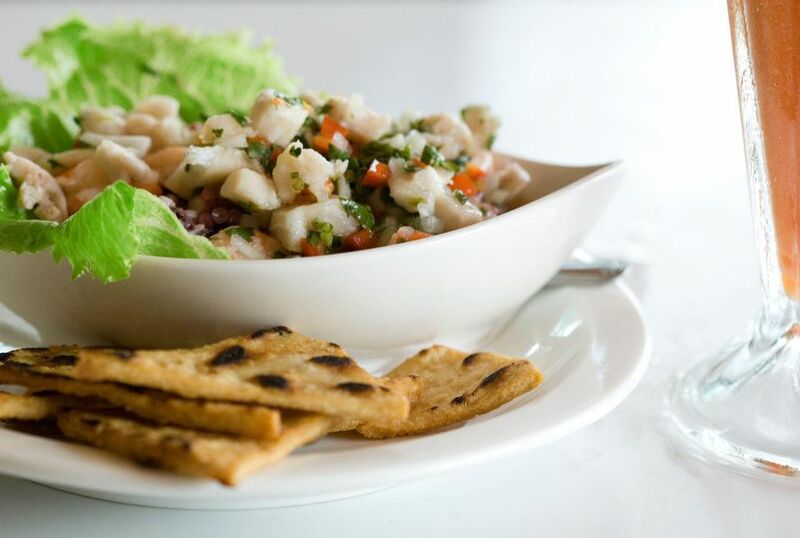 Ceviche is typically served at lunch or brunch, and because it is so light and refreshing, it’s popular at the beach. Ceviche restaurants ("cevicherias") often close around 4 p.m. because the fish caught in the morning is no longer fresh by afternoon. Ceviche is usually made with sea bass or flounder, but just about any fish or shellfish will work. The other ingredients vary widely. Ecuadorean ceviche is often made with shrimp and ketchup in addition to the lime juice and served with corn nuts. In Chile, ceviche is made with Chilean sea bass, grapefruit juice and cilantro. In Peru, ceviche is garnished with thinly sliced onions and aji limo, aji amarillo or rocoto chili peppers. It’s served with sweet potatoes and large-kernel Andean corn on the cob (choclo). Only a true ceviche lover would dare try tiger’s milk ("leche de tigre"), which is the leftover ceviche marinade served in a small glass. Brightly colored from the spicy chili peppers and sometimes mixed with vodka, tiger’s milk is considered an effective cure for tough hangovers. Ceviche has become trendy outside of South America, and chefs like to experiment with exotic ingredients such as passion fruit, coconut milk, octopus, shark, avocado, celery and mango.